Albert B. Southwick, the seventh of nine children, was born in 1920 and grew up in Leicester, Massachusetts, on the farm that had been in his family for generations. He attended Mannville School, a one-room wooden building where a single teacher taught all eight grades. He went on to Leicester High School, Clark University in Worcester, four years in the United States Navy during World War II, back to Clark for his M.A. degree, and on to Brown University in Providence, Rhode Island, where he did a year of graduate work in U.S. history. From 1950-1952, he was a historian (civilian) for the U.S. Seventh Army, based in Stuttgart, Germany. On his return from Germany, he worked briefly as a reporter for the Providence Journal before coming to the Worcester Telegram and Evening Gazette in 1952 as an editorial writer. 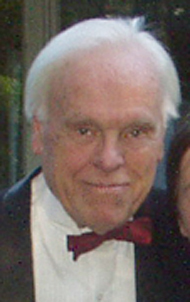 He was chief editorial writer for the newspapers from 1968 to his retirement in 1986. He has written numerous books and two librettos, and currently writes a weekly column about local history for the Worcester Telegram. Annie's Book Stop, and the Food For Thought Bookstore & Café. They may also be purchased via Amazon.com (links below). This fascinating collection of articles from the Worcester Telegram and Gazette provides an entertaining and illuminating look at Worcester's rich history. From the first lawsuit, through the woman's rights convention, to Emma Goldman's fiery speech in support of anarchy, Southwick shares his love and knowledge of Worcester County. A second volume of lively articles by the retired chief editorial writer for the Worcester Telegram & Gazette. From Andrew Hakell Green,the man who oversaw the creation of New York's Central Park, to Major Taylor " the Black Whirlwind", the fastest bicycle racer in the world, Worcester was the home to an extraordinary array of individuals and events. In 150 Years of Worcester: 1848-1998 , Albert B. Southwick commemorates Worcester's official incorporation as a city in 1848 by recounting history from then to the present. Albert Southwick examines the Molasses Act of 1733 in colonial America, and how it, and other acts of the British Parliament, set the stage for the American Revolution. This collection of letters between WWII Navy Pilot Albert B. Southwick and his family back at Maple Hill Farm in Leicester, Massachusetts spans February to June, 1942. Young Albert details his experiences first at the Naval Training Station in Newport, Rhode Island, then at the Naval Air Base Station Service School in Jacksonville, Florida. The entire collection, some of it written in rhyming verse by Albert's father Nathan Marshall Southwick, recalls a bygone era when written correspondence was a carefully crafted art form. Footnotes added by Albert's daughter Martha Jean Southwick illuminate many of the references. Young sailor Albert (now 22 years old) details his experiences at US Naval Air Training Stations in Jacksonville FL, Norfolk VA, Moffett Field and Alameda CA, New Orleans and Natchitoches LA. Young sailor Albert (now 23 years old) details his experiences at US Naval Air Training Stations in Natchitoches LA, Athens GA, Milton and Pensacola FL, where he finally "gets his wings." This third volume also includes over 60 images. This fourth volume of Albert Southwick's war letters takes us to the end of the war. Young naval aviation pilot Albert, now 24 years old, writes home from Florida (Jacksonville), Kansas (Hutchinson), Illinois (Chicago), Washington (Seattle and Whidbey Island), Oregon (Grants Pass) and Alaska (the Aleutian Islands: Shemya, Attu and Kodiak). This collection of richly detailed essays, written between 1956 and 1958, recount the author's boyhood growing up on a New England farm in the 1920s and 30s. This collection of reminiscences, written originally in 1959 and 1960 for the "Feature Parade" in Worcester's Sunday Telegram, recount the author's boyhood growing up on a New England farm in the 1920s and 30s. This collection of reminiscences, written originally in 1961 and 1962 for the "Feature Parade" in Worcester's Sunday Telegram, recount the author's boyhood growing up on a New England farm in the 1920s and 30s. A fourth and final volume of reminiscences, written originally between 1962 and 1964 for the "Feature Parade" in Worcester's Sunday Telegram, recount the author's boyhood growing up on a New England farm in the 1920s and 30s. Also included in this volume is "New England Around the Year", a small collection of Albert Southwick's articles from the Worcester Telegram and Evening Gazette from the late 1950s.. This collection of Southwick's Greatest Hits Volume II, selected and compiled by daughter Martha J. Southwick, includes talks, articles and even a sermon on grief held at the First Unitarian Church in Worcester. In June of 1967, Israel waged a pre-emptive six-day war with Egypt, Syria and Jordan. When the dust settled, Israel had seized the Sinai Peninsula and Gaza Strip from Egypt, the West Bank and East Jerusalem from Jordan, and the Golan Heights from Syria. In September of that year, Albert B. Southwick of the Worcester Telegram and Evening Gazette in central Massachusetts visited many key sites in the Middle East and sent reports home about the changing political and military situation. The community of Leicester in central Massachusetts has a rich history. From the purchase of an area the natives called "Towtaid" in 1686 to the present day, Leicester has experienced settlement by farmers and merchants, and its incorporation as a town in 1722. Its military readiness set the example for the American Revolution's "Minute Men", and it was an enclave of religious tolerance. It was the birthplace of the carding industry and cradle of the wire industry during the 1800s. Local historian and life-long Leicester resident Albert B. Southwick, born in 1920, has gathered in this volume his reminiscences about Leicester, its people, its villages and buildings. Illustrated with over 50 images, Leicester Recollections is a delightful tale that is sure to stir the memories of those who have shared many of Mr. Southwick's decades in that town, and will be a rich source of interest and detail for those who have not. Albert B. Southwick, local historian and life-long Leicester resident, has brought together in this volume the stories of many of the noteworthy people who helped shape Leicester over the centuries since its founding as a community. Their tales are as unique as the town they helped shape. 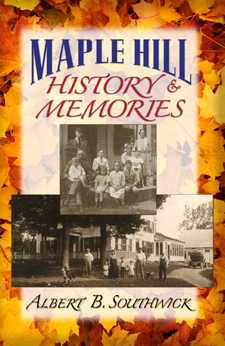 Maple Hill Farm is nestled in the northeast corner of the town of Leicester in Massachusetts. More than two centuries of Earles and Southwicks have lived on or near this property, and if the walls could talk, there would be no end to the tales they could tell. Albert B. Southwick spent his formative years at Maple Hill Farm, and has known many of those people and their stories. In this volume, he brings together history and his own memories to capture the story of a family and their home. The following books by Albert B. Southwick are long out of print and only available from second-hand book shops/sellers. Click the cover image to search on Amazon.com, or click the book title to search on ABEbooks.com. Albert Southwick has a Wikipedia entry! as an editorial writer, historian, storyteller and community observer." " Al, I read your column regularly and I just love the way you tell the story. It is almost like we are sitting around a fire, talking and having a great time. Your style is unique and I enjoy it very much. Thank you for not letting history die. Fade it will, but it should never die." about the meaning of freedom, that people of color should enjoy the same rights and privileges as everyone else. felt segregation was justified and right. That took courage." "To read this first volume of "Down on the Farm" columns is to take a journey back to the first half of the twentieth century. we risk forgetting the simple things that matter most." that we may look forward to a further volume by and by." "For decades I have looked forward to reading Mr. Southwick's great articles. I count them as one of the most important parts of the paper. Thanks, a million, Albert." with Eggy and Ralph, catching frogs in the small water hole behind the barn, and rowing the boats on the big pond. I accumulated rolling in the piles. I was happy to see the article about Aunt Ann, what a wonderful person she is. Again, Happy Birthday and as Bob Hope always said, 'Thanks for the Memories'." our Thursday Telegram & Gazette for many years to come."